A few of our custom websites are listed below. Get your website started with AvailX . To Process Your Web Request or Get a Quote click here . Cookies In Bloom prides itself in the creation of delicious and creative cookie baskets, gift baskets, cookie bouquets, and other cookie arrangements. We offer a wide selection for many gifts such as birthday gift ideas, anniversary gift baskets, business gift baskets, children or kid gift ideas, bachelorette gift baskets, and thank you gifts. We also offer holiday gift baskets such as Christmas gift ideas and gift baskets, Valentine's Day gifts, and Mother's Day gift baskets just to name a few. You can visit Cookie Bouquets and Cookie Favors at Cookies In Bloom . We are Dallas jewelers who can offer you the best prices on diamond jewelry. We also offer great prices on certified loose diamonds by GIA or EGL at wholesale prices. We love to create wonderful diamond jewelry including: Diamond Earrings , Diamond Bracelets, Fashion Rings, Diamond Solitaire, Engagement Rings, Anniversary Bands, Diamond Necklaces. You can visit Diamond Jewelry in Dallas at Diamond & Gold Warehouse . 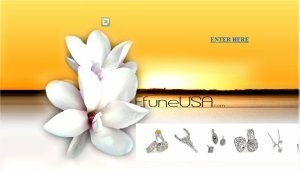 EfuneUSA designs and manufactures provides the finest quality jewelry to retail establishments across the country. We have been in the forefront of The Jewelry Wholesale and Manufacturing Industry for over 60 years and particularly in the United States since 1986. Efune is widely recognized for exciting, trend setting styling and ideas. Efune is continually bringing new ideas and styling while still maintaining classic and time honored styles for our discerning customers. To ensure that we have the best to offer our customers in up to date styling in the market place, Efune emphasizes very closely on styling and quality craftsmanship while striving to ensure the highest levels of customer service. With the combination of a strong history, an established name in Fine Jewelry and Italian Gold Chain and our highly committed team, we feel we can help our customers achieve their goals. Jewelry stores from Arkansas, California, Texas to New York, carry our jewelry. You can visit Diamond Jewelry at EfuneUSA . The law firm of Fielding, Parker, and Hallmon, LLP assists clients throughout the state of Texas in the prosecution and defense of a variety of state and federal employment law matters including civil rights, labor/management relations, federal sector employment, wage and hour law and restrictive covenants prohibiting competition. You can visit Texas Civil Attorneys and Lawyers . Direct importers of loose diamonds, all shapes and sizes. We specialize in 1.00 carat and up GIA and EGL certified diamonds. Large selection of: Diamond Engagement Rings, Diamond Stud Earrings, Bracelets, Pendants, Diamond and Colored Stone Fashion Jewelry, Pre-Owned Rolex Watches! You can visit The Diamond Jewelry Company here . Rodney Herson has been working exclusively with Mercedes-Benz since 1974 and makes it his life goal to be 100% dedicated so that you are 100% satisfied. Rodney Herson Automotive's superior services provide you and your vehicle with nothing but first class attention. Allow us to show you the treatment you deserve and you’ll never take your treasure elsewhere. You can visit Rodney Herson Automotive here. If you want to taste some down home country cookin' come and visit Sandy's Real Chicken Fried Steak Restaurant. They have the best in the Metroplex. Sandy's believes in using quality ingredients and cooking the way that brings back all the wonderful memories of childhood. You can visit Sandy's Real Chicken Fried Steak here .